The following is Adam's presentation given at the national conference in Nashville. In his absence, the paper was delivered to the participants by family members. Let me begin by stating that I am grateful for this opportunity to speak to you today, even if it is by proxy. The Reentry Programs that I will be discussing are premised on the core topic of continuing education. To date, education is the only proven means of substantially reducing the rate of recidivism. In fact, Education and Recidivism share an inverse relationship. Project are my attempts to create a more comprehensive means of reducing the rate of recidivism utilizing my own firsthand knowledge and experiences. However, this second time around through the federal system has been an entirely different experience. When I arrived at the federal penitentiary with a fresh life sentence and still only 24 years old there were a number of older, wiser men who tried to set me on the right path and keep me out of trouble. Those men made an investment in me early on that ultimately lead me to where I am today, and I am forever grateful for the positive impact they had on my life. To my surprise, when I arrived here at FCI McKean 3 years ago, one of those same men was already here and waiting to help me make this very pivotal but difficult transition down to a lower custody facility. It's hard to believe that even now, thirteen years later and nearing age 40 myself, he STILL has a very strong and positive influence on my daily routine...and to be honest…without his encouragement it's unlikely that I ever would have attended my first McKean Reentry Council Meeting with staff members because there are certain "codes of conduct" that we must live by as inmates, and at the very top of that list is a clear dictate not to interact with staff. Obviously, this mentality only further contributes to what is already an inherently adversarial relationship. partnership between staff and inmates there's no way for reentry programming to even function effectively, let alone optimally. Council and began convening monthly meetings. The purpose of these meetings has been to bring together the Executive Staff, department supervisors, and a number of inmate facilitators to discuss which reentry programs are showing signs of success, which ones need support, and what more can be done to improve our long term success. Initially, I was extremely uncomfortable sitting down together with staff members at these meetings, but I quickly began to realize what an incredible opportunity it was for us, the inmate population, to positively shape our own environment. During my first reentry panel meeting about a year ago, someone suggested that I would be a good candidate to create a group for the many "lifers" of McKean and for some reason still unknown to me I decided to seize that opportunity. It was in that moment that I personally became involved in the McKean Reentry Movement. would be a great way for us to begin positively influencing some of the young men on this compound. However, at that same time there were a number of us who were already enrolled in a Life Coaching Course and we recognized how valuable those skills would be within this environment. So we chose to evolve our inmate mentoring idea into more of a coaching/mentoring hybrid model that better suited all of our needs. We knew that coaching, as opposed to mentoring, would allow us to identify and build on each young man's strengths, instead of focusing on his weaknesses. We also knew that most of us as youths had trouble accepting any sort of "authority" in our lives and we wanted to ensure a very different dynamic in the relationships that we were building. Coaching provided that dynamic for us. Due to our very limited resources "The HOPE Coaching Project" had to maximize what was available to us at the time. Of course, the most valuable resource we had was ourselves, the HOPE Coaches. To ensure the initial credibility and short-term success of our program we really had to "Walk the Talk" and become human billboards for our program. There was no shortage of young men who wanted to be involved in the program, so we decided to form our initial partnerships with those who were already enrolled in GED classes. We wanted to send a clear message about the importance of education and this allowed us to do just that. Although our initial objective was to form 10 partnerships within the first six months, we've already formed nearly double that many in the first 120 days. The next step is to expand the program to other federal facilities within the Northeast Region before the end of 2015 and then throughout the rest of the nation prior to the year 2020. Of course this SOUNDS great, and it looks great on paper too, but what everyone really wants to know is, "What makes this reentry program more effective than the other programs already out there?" The simple answer to that question is the HOPE Coaches themselves. These are men who have chosen to fully invest themselves into THIS COMMUNITY and into the personal growth and development of all its members. Earlier I mentioned my experience in a State Youth Correctional Prison and about the myriad resources that were available to me but how it wasn't sufficient enough to keep me from returning. What I didn't have back then, but needed badly, was a strong, positive male role model to set me straight and guide me toward a more productive life. There were a few male staff members there that might have been able to fulfill that role under different circumstances but I simply didn't trust any of them on account of the title they held. Not surprisingly, most of the young men I now work with here at FCI McKean feel much the same way. credibility, as Mr. Shakir and I recently demonstrated while acting as co-facilitators of the Victim Impact Course. although we do not YET have a post-secondary education program here at FCI McKean we do have a very strong partnership with the University Of Pittsburgh at Bradford . My HOPE is that we can find a way to RAISE the necessary funding to establish a degree program for EVERYONE who makes a sincere commitment to pursuing higher education while incarcerated here at FCI McKean. Few of you probably know that the average MONTHLY wage for federal prisoners is only FIVE DOLLARS per month, and since all prisoners have been excluded from receiving federal PELL Grants, few inmates have the financial resources to pursue any sort of education beyond a GED while incarcerated. What I am proposing today is the creation of a special type of student loan for state and federal prisoners that would allow them to pursue post-secondary education degree while incarcerated. Upon release from prison, as partial repayment of those loans, recipients would be required to participate in local community service projects or find employment within a state or federal government agency utilizing whatever degree had been earned for a pre-set term. This new student loan program would also help to promote the concept of "restorative justice" by utilizing community service as a means to (help) satisfy the needs and obligations originally created by the commission of the ex-offender's crime. ex-offenders would remain on parole or supervised release until their loans had been repaid in full. Ideally, they would continue to receive the support of a mentor or coach throughout this critical, final phase of reentry as well. Presently, we are trying to form partnerships with community reentry organizations that are already utilizing mentoring and coaching to help ex-offenders make a successful transition home. Our goal is to ensure that the young men now in the HOPE Coaching Project will have the continued support and guidance they need once they are released, no matter where they might be headed. Some of you may be familiar with the results of a study on half way houses that was recently conducted in the state of Pennsylvania. The study's authors compared the recidivism rates of those inmates who were released on parole after serving a term in a halfway house versus those who went directly out onto parole from prison. What the results revealed was that those prisoners who used the halfway house to transition back out into the community were actually MORE LIKELY TO RECIDIVATE. Obviously there are a multitude of possible contributing factors to the findings recorded in this study but what is most important to note is that the current model is clearly NOT WORKING the way that it was intended SO WE NEED TO MAKE SOME IMPROVEMENTS. I believe that we can be much more effective at every level of reentry if we learn to better communicate with all involved parties and work to address the specific needs of inmates long BEFORE they are released. The HOPE Coaching Project plays an integral step in that process but it is not the only step. There is another concept in development called The RAISE Reentry Project that Mr. Shakir and I initially conceived as part of our final "Inside Out Program" group project with University of Pittsburgh-Bradford to address all of the aforementioned deficiencies. What we envisioned was a reentry program that would provide participants with the optimal continuity of reentry services, beginning inside prison and stretching all the way back out into the community. This Project was meant to target those men who would prefer to pursue higher skill development, in the form of a United States Department of Labor Apprenticeship Certification, instead of a college degree. Program participants would live together on a special housing unit inside the prison where their primary focus would be on learning and honing the skills of their trade, but residents would also be required to address common reentry concerns such as: substance abuse counseling, cognitive therapy and practical preparation needs like obtaining a birth certificate, Social Security Card, and establishing a bank savings and checking account. Each RAISE Unit resident would be required to complete at least ONE HALF of their apprenticeship certification hours before they could be considered for special placement to a designated RAISE Project Half Way House out in the community. preparations for their final release. There would be an open line of communication between prison case managers and halfway house counselors to ensure that each participant's individual reentry needs were being met at every stage of the reentry process. All RAISE Project graduates would possess a U.S. Department Of Labor Apprenticeship Certification, an established work history with future employment references, proper identification, a savings and checking account and the self-confidence needed to break the cycle of recidivism. The HOPE Project and The RAISE Project perfectly complement one another as they both address the necessity of continuing education for all inmates. Either avenue is certain to dramatically increase each participant’s odds of successfully reentering society. In closing, I would like to state that I am (still) extremely optimistic about the vitality and longevity of the current reentry movement we are experiencing. My HOPE is that Director Samuels, Attorney General Holder, and other members of the current Administration will take notice of what the inmates and the executive staff have TOGETHER managed to accomplish here at FCI McKean, and that they will encourage other federal facilities to adopt our model of reentry programming. 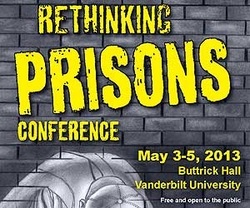 Lastly, I would encourage all of YOU in the audience today to become more actively engaged in Rethinking Prisons. There are countless men and women currently struggling to break the cycle of recidivism who could use your help, and I HOPE that before you leave here today, you'll decide to make a personal investment toward the success of future ex-offenders in your area. I would like to thank all of you who made this presentation possible. Read Adam's final statement in response to the Federal Bureau of Prisons' last minute decision to cancel his direct participation in the conference here.